Seventy-three stories high, the GM building in the City of Detroit, Michigan in the USA, towers over the rest of the waterfront buildings, four of which are 39 story office buildings. Built in 1976, the GM Building covers 2,217,500 square feet and in 1996, it was bought by General Motors to become the world headquarters for GM. General Motors is one of the largest manufacturing companies throughout the world and in 1985, this building was declared as a National Historic Landmark. From across the Detroit River in Windsor, Ontario, one will get the best view of the beautiful skyline of Detroit, Michigan. 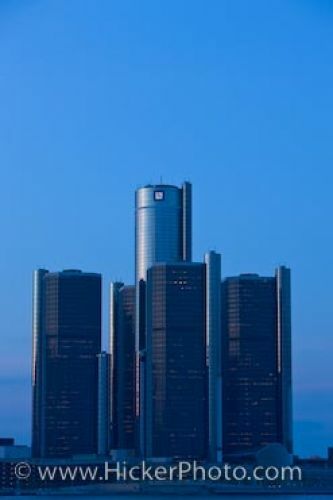 GM Building in the city of Detroit, Michigan, USA seen from the city of Windsor, Ontario, Canada. Picture of the skyline of Detroit, Michigan from Windsor, Ontario where the GM building dominates.